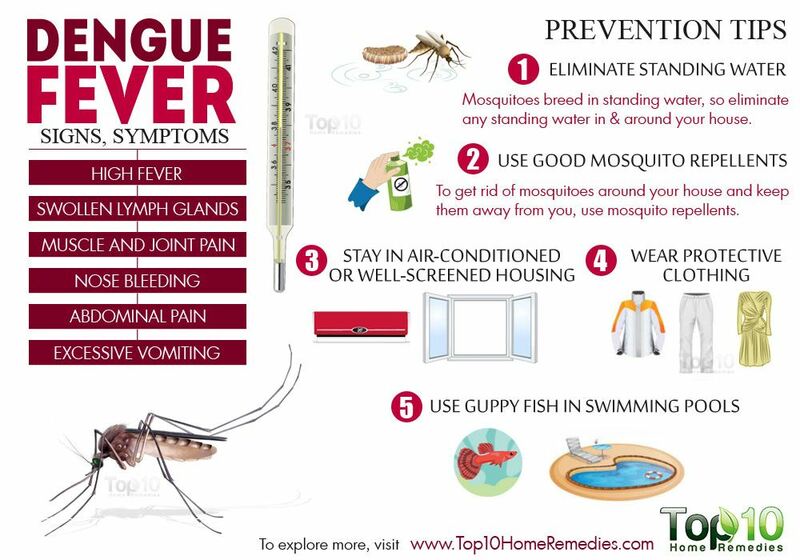 Dengue fever, also known as breakbone fever, is a debilitating mosquito-borne disease common in tropical and subtropical regions of the world. This type of fever is caused by any one of four closely related dengue viruses, which are related to the viruses that cause West Nile infection and yellow fever. This illness can affect infants, young children and adults. According to the World Health Organization, an estimated 390 dengue infections occur worldwide each year of which about 96 million manifest apparently. People living in the following areas are at greatest risk: Sub-Saharan Africa, Central America, Mexico, Pacific Islands, Southeast Asia, Southern China, Taiwan and northern parts of Australia. People get dengue fever after being bitten by an infected Aedes mosquito. The virus does not spread directly from person to person. Symptoms usually occur between 3 to 10 days after being bitten and last for up to 10 days after the incubation period. 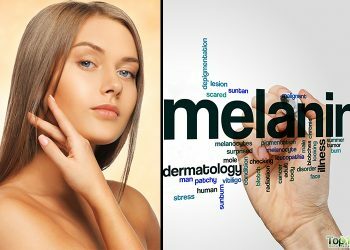 The most common symptoms include a high fever (104 degrees Fahrenheit or 40 degrees Celsius), severe headache, swollen lymph glands, muscle and joint pain, mild skin rashes, and mild to severe nausea. It may also cause mild bleeding from the nose or gums and easy bruising. When the infection is not controlled in time, the disease develops into the life-threatening dengue hemorrhagic fever. People with a weak immune system or those who have had this infection more than once are more vulnerable to this problem. The symptoms during this phase include profuse bleeding from the nose, abdominal pain, excessive vomiting, low blood platelet count, blood plasma leakage, respiratory distess, dangerously low blood pressure and problems with the lungs, liver and heart. There is no commercially available vaccine or specific medicine, so prevention is better than any remedy or treatment. If you believe you may be infected with dengue, you should see your doctor immediately. Also, be sure to rest, drink plenty of fluids and take steps to reduce the fever. 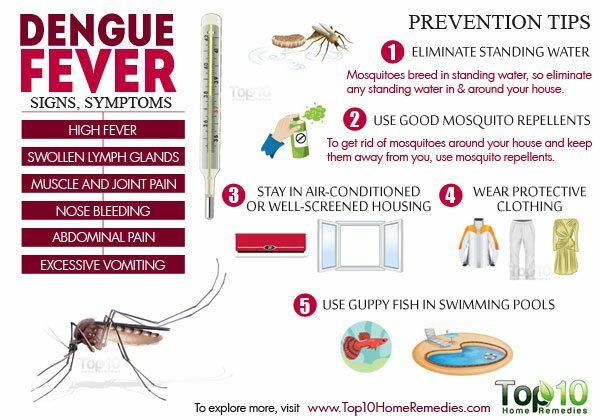 Here are the best preventive tips for dengue fever. Mosquitoes breed in standing water, so eliminate any standing water in and around your house. Look for water accumulating in places like empty planters, flower pots, fridge trays, storage or garbage bins, cans or any empty container. Even birdbaths and water bowls for pets that become stagnant can attract mosquitoes. These areas should be checked and emptied or changed regularly. 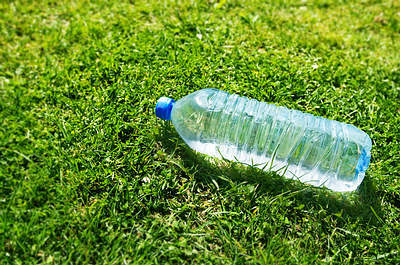 If not needed, discard items that collect rain or run-off water, especially old tires. Also, unclog roof gutters and watch out for bromeliad plants as the funnel-shaped leaves often hold water. To get rid of mosquitoes around your house and keep them away from you, use mosquito repellents. Apply a good mosquito repellent on any exposed skin. This is especially important at dawn and dusk, when mosquitoes are most active. 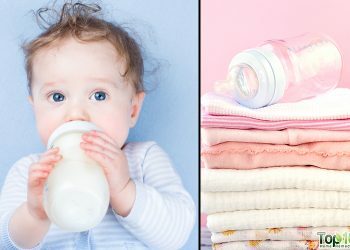 Use repellents with caution on infants and babies, and do not use them on infants younger than 2 months old. You can also make an organic insect repellent at home using ingredients like witch hazel, vanilla extract and essential oils like lemon, lemongrass, lavender, peppermint, eucalyptus and citronella oil. You can use high-tech gadgets, such as anultrasonic mosquito repellant, or plug-in devices containing liquid insecticide in your home and office. To reduce the risk of contracting dengue fever, make sure your housing is well-screened to keep mosquitoes out. Attach screens to all windows and doors where mosquitoes can enter. Always keep them closed and repair any holes in the screens. If possible, opt for air-conditioning. Mosquitoes cannot survive in a cool atmosphere. If your room is not screened or air conditioned, use a mosquito net around your bed. Something as simple as clothing can protect you from being bitten by a mosquito that may be carrying the dengue virus. Cover as much of your skin as possible by wearing loose, long-sleeved shirts and long pants. You can also spray your clothing with mosquito repellent. Wear light-colored clothing, as dark colors like black and blue attract mosquitoes (insects and bugs can see dark objects more easily). Avoid wearing short-sleeved shirts or shorts, as mosquitoes can easily bite through thin clothes. Instead of wearing sandals or open shoes, wear shoes with socks to protect your feet. It can be difficult to keep the water in swimming pools clean, especially if you cannot cover them. An easy solution is to put some guppy fishes in the pool to control the growth of mosquitoes. The guppy, a freshwater fish, eats mosquito larvae and eggs, thus controlling the mosquito population. This fish is readily available in the market. Mosquitoes responsible for dengue fever are more active in the daytime than nighttime. Also, they bite more at dusk and dawn. Hence, avoid being outdoors at dawn, dusk and early evening. When taking a nap during the day, sleep under mosquito netting. In fact, this is essential for small children when sleeping, as they are at a higher risk due to weak immunity. Do not allow small children to play outdoors, especially during the early evening. While visiting dengue-infected areas, take steps to limit your exposure to mosquitoes. 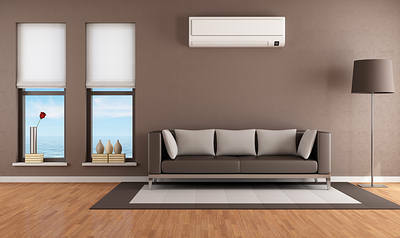 Stay in a hotel or resort that has air-conditioned facilities. The windows and doors also must have secure, intact screens. If your hotel or resort does not have air conditioning, ask the management to provide mosquito netting and plug-in devices. 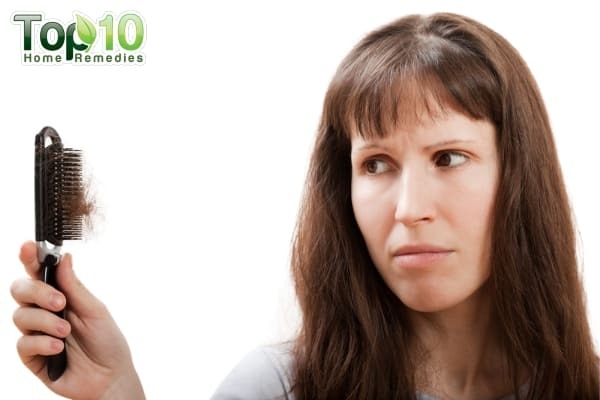 Use a good mosquito repellent that can be applied to exposed skin and clothing. Wear proper clothing while traveling. Whenever there is a risk of dengue fever, you can use the herb basil to reduce your risk. Its immune-boosting properties can prevent you from getting ill. If you have a high fever, consult your doctor to rule out the possibility of a dengue infection. In the meantime, you can try basil leaves to bring down your temperature. Simmer a handful of basil leaves in 2 cups of water on low heat for 20 minutes. Strain, allow it to cool slightly and drink it once or twice daily. 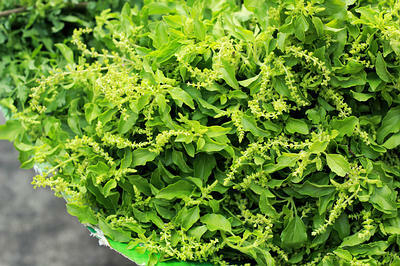 You can even chew tender basil leaves to bring down a high temperature. A well-hydrated body is less likely to get sick. In addition, blood cells comprise water and protein, hence drinking plenty of water prevents a low platelet count, a common symptom of dengue. Drink an adequate amount of filtered, purified water to keep your body hydrated and your blood platelet count within a normal range. Along with water, you can drink lemon water, orange juice, vegetable juice, soup and clear broths to increase your fluid intake. Note: If you have any kidney problems, consult your doctor before increasing your fluid intake. 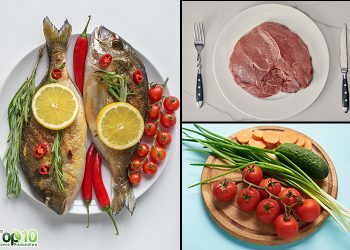 Dietary steps can be taken to help prevent or treat several common viral conditions as well as dengue. 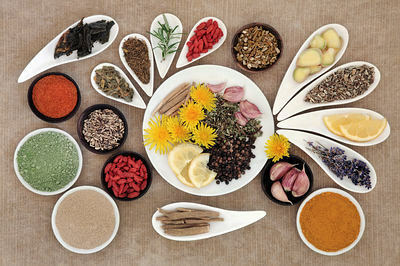 Foods and herbs rich in antiviral properties will protect your body from infections. Common kitchen ingredients, such as ginger and garlic, must be included in your cooking or eaten raw. Some of the herbs rich in antiviral properties include astragalus root, cat’s claw, elderberry, lemon balm, licorice root, mullein, olive leaf and oregano. Always consult a doctor before including any herb in your diet to learn about any side effects and a safe dosage for your condition. Mix 1 tablespoon of raw, unfiltered apple cider vinegar in a glass of water and drink it twice daily. Drink green tea twice daily.